As NetApp’s only Learning Partner in all three NetApp regions Americas, EMEAR and Asiapac we are proud to announce that we will be exhibiting again at their annual technical conference – NetApp Insight. NetApp Insight offers a unique opportunity to dive deep into the trends and technology shaping the future of storage and data management. You’ll return to your job up to date on emerging technologies, confident about getting the most from your NetApp investments, and energized to help your business succeed. Make sure you stop by the Fast Lane booth C18 at Insight Central to grab some free training vouchers. While at our booth, a Fast Lane representative would love to speak with you about our training solutions and services which will enable you to achieve your personal and professional goals. 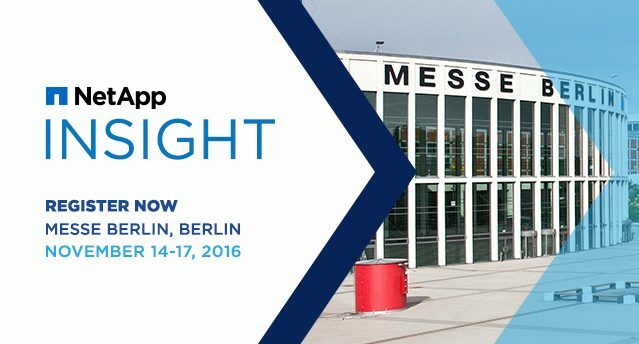 We look forward to seeing you at NetApp Insight 2016, booth C18 in Berlin!